감지은니대방광불화엄경 주본 권5~6(紺紙銀泥大方廣佛華嚴經 周本 卷五~六)책은 당의 실차난타가 번역한『화엄경』주본 80권 가운데 권5와 권6의 내용을 옮겨 적은 것으로, 검푸른 빛이 도는 종이에 은가루를 이용해 글씨를 썼다. 병풍처럼 펼쳐서 볼 수 있는 형태이며, 접었을 때의 크기는 세로 31.1㎝, 가로 10.5㎝이다. 표지에는 화려한 꽃무늬와 제목이 금색으로 처리되었고, 권5의 첫머리에는 불경의 내용을 요약하여 묘사한 변상도(變相圖)가 금색의 가는 선으로 정교하게 그려져 있다. 본문은 금색 테두리 안에 은색 글씨로 정성들여 쓰여져 있다. 불경을 만든 경위를 적은 글이 없으나 표지, 변상도, 본문의 글씨 등이『감지은니대방광불화엄경주본』권37(보물 제754호)과 비슷한 것으로 보아 14세기 무렵에 만들어진 것으로 보인다. Daebanggwangbul hwaeomgyeong, which is also abbreviated to Hwaeomgyeong (Avatamsaka Sutra), contains the central idea that Buddha and all creatures are one, rather than many. The Avatamsaka Sutra, as the basic sutra of the Hwaeom Order of Korean Buddhism, was one of the most influential sutras in the establishment of Korean Buddhism along with the Lotus Sutra. This book was transcribed from volumes 5 and 6 of the 80 volumes of the Zhou version of the Avatamsaka Sutra translated by Siksananda of the Tang Dynasty. 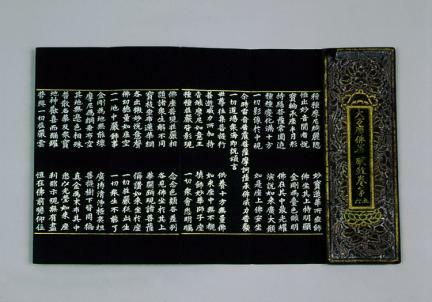 Written in silver on indigo paper, it is a folding screen type of book measuring 31.15 cm by 10.5 cm when folded. 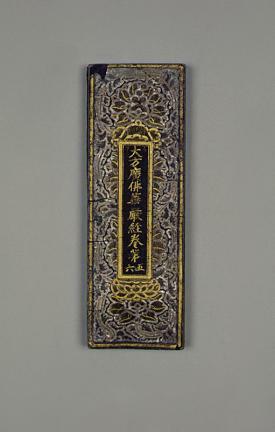 The cover, which is decorated with a splendid flower design, bears the title written in gold. 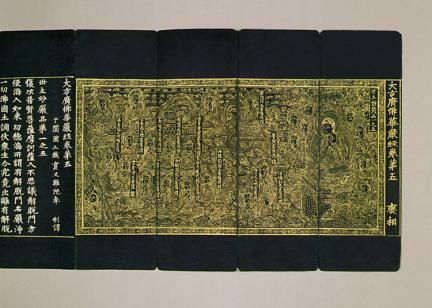 The illustration, which summarizes the contents of the sutra in pictorial form, is elaborately drawn in thin gold lines at the beginning of volume 5, while the content of the actual sutra is written in silver inside the golden frame. There is no record as to the reason why this transcription was made, but it is estimated to have been printed sometime in the 14th century during the Goryeo Dynasty as the styles of the cover, illustration, and writing are similar to those of the Transcription of the Avatamsaka Sutra (The Flower Garland Sutra), Zhou Version, in Silver on Indigo Paper, Volume 37 (Treasure No. 754).